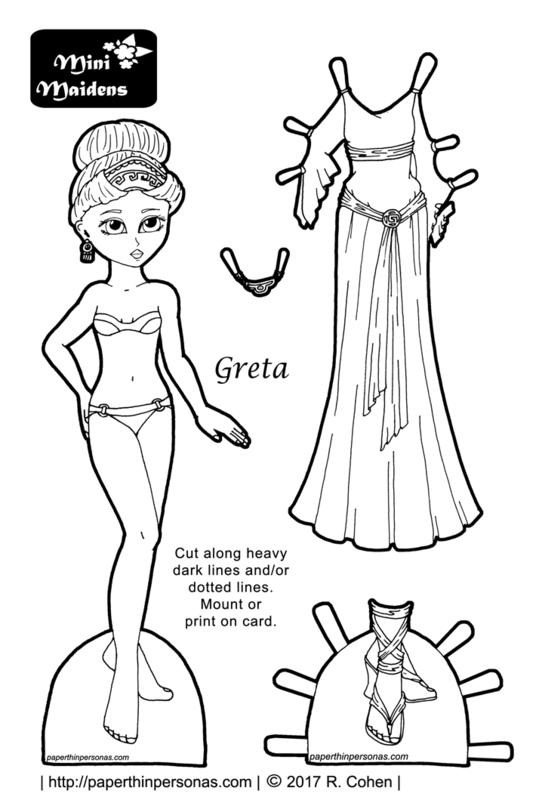 Today’s paper doll is a black and white Ancient Greek inspired Mini-Maiden doll. I chose Greta to be the model for today’s Ancient Greek fantasy gown, though of course it will fit any of the Mini-Maiden dolls. Her hair was also inspired by Ancient Greek styles, but her shoes were totally not. I worry about strange things on the blog sometimes, like making sure every paper doll series has equal attention. There are 52 weeks in a year. There are six paper doll series. That means there are about 8.6 dolls going to be posted per series. Since I don’t know what a .6 doll would look like anyhow, I have to round that to 8 for some series and up to 9 for others. The truth is though, since I have done at least one all doll week (started on May 8th) I don’t really think my careful planning is going to create evenly balanced numbers of annual dolls per series. Though I’d be lying if I said I hadn’t created a chart at the beginning of the year in a vague attempt to do this. What can I say? I am a librarian through and through. In my head, I categorize the fantasy dresses I draw based on their basic inspiration. There are medieval inspired gowns (like this one), renaissance inspired gowns (like this one), and Ancient Greek inspired gowns, like today’s Greta doll’s gown. Further evidence of my tendency to categorize things. And now that I successfully demonstrated what a strangely obsessive human being I am, I’d love to know what you think about today’s Ancient Greek fantasy gown. Leave me a comment if you’d like to share your thoughts. I think she is very beautiful. Her hair is very interesting, I wonder, if the decoration is fabric or made of some stiff material. I’ve always admired how elegant clothing can be made just with rectangle pieces of fabric and some knots or brooches. And those sandals! Love the doll and the outfit. The hair is interesting – I saw it as a kind of 1940s roll, in front, using a beautiful fabric as the roll part, if you know what I mean. (as opposed to pantyhose or old hair or something.) Great idea.